Welcome to a new series: Baking in Kenya. This series will focus on the ingredients that are used in baking and are available in Kenya. We hope this will help you in your wonderful journey to be the best baker you can be ^_^. This post will focus on the types of flours used while baking. All-purpose flour is a kind of wheat flour that can be used for multiple uses, hence the name all-purpose. It's the most common, easily available and economical wheat flour found in most shops, supermarkets and wholesale shops. All-purpose flour can be used to bake cakes, cookies, scones, doughnuts etc. A packet of 2Kg ranges from Kshs. 125-140 depending on the brand. This is a wheat flour that has a chemical rising agent added to an all-purpose flour. It's used for cakes where recipes have little or no rising agent required, cookies, sponges and biscuits. A packet of 2Kg costs from Kshs. 125 - 140 depending on the brand. Bakers flour is a wheat flour that has a high gluten content. Gluten is the protein found in wheat flour that makes it sticky. This flour is used for breads, buns & other bread products. It is particularly good for those products since the dough is able to proof properly without collapsing and to it's full capacity. 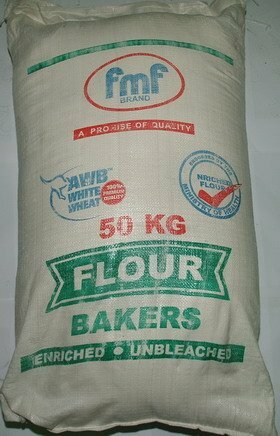 Bakers' flour sold in Kenya is available in 50 Kg bags, they range from about Kshs. 3,000 to 5,000; depending on the brand. Whole wheat flour is a whole meal flour that is very healthy and nutritious. It's when the wheat is milled together with the skin for a whole meal wheat flour. This wheat flour is not easy to bake with on its own since the gluten content is very low. Therefore, you have to add a small amount of all purpose flour or bakers' flour, depending on the product you are baking. A 2Kg packet of this flour is about Kshs. 130-150; depending on the brand. Atta flour is another form of whole meal wheat flour, it's made from durum wheat from India and is mainly used for chapatis but can also be used while baking whole wheat breads. It can be one of the wheat flours you combine with a whole wheat flour and bakers flour. It is also a highly nutritional flour. You can also use it to make mandazis and doughnuts. A 2 Kg packet of this flour ranges from Kshs. 135-150 depending on the brand. Cake flour is a highly refined flour with a lower gluten content that is used for making perfet cakes, it is preferred by pastry chef because the cake products baked have a very soft & fine texture. However, this is not easily available in Kenya and it sometimes has to be imported. There is a simple way of making your own cake flour; measure 1 cup of all-purpose flour, then remove 1 Tablespoon of it and replace it with 1 Tablespoon of cornstarch which can be bought in cake supplies shops such as Topserve Ltd. This will also give you a kind of cake flour and your cakes will be wonderful, light and soft. We hope this was helpful to you. If you have any questions or additional suggestions, please feel free to comment below. Other than Pembe and premier cookies,where and what are the other brands of bakers flour available in Nairobi?Contacts? Any guide on where I can get the cake flour you mention above. I have looked in the 2 major supermarket chains and not found it. Are there any specialty bakers supply shops that I might find it at? Hi AP, unfortunately I'm not sure where you can get cake flour, have never really found any in Nairobi, but haven't looked in a while. Maybe check Chandarana supermarket. It's very rare to find it in Kenya. How about the actual wheat grains? We mill our own here in the US, and are probably moving to Kenya next year. I'm trying to decide what kitchen tools to bring with us. Can we find wheat grains and oat (Groat) grains - specifically in Nairobi? Hi, what of bread flour? if not available what can substitue it? Can I bake bread with Atta flour alone or I have to mix it with all-purpose flour? I want to bake brown bread. You have to add some white flour due to the gluten content. Gluten is what helps your bread rise; Atta has a very low percentage and white flour has a higher percentage...that's why you always need to add a bit of white flour for your brown bread to rise. However; you can try buying Exe Brown bread flour...I found it's easier to use while making brown bread.. you don't have to add too much white bread, just a small ratio. I hope that's helpful. Let me know how it goes. Thanks for reading the blog! Hi, where can I purchase the bakers flour that is pictured above in Nairobi? I assume this is equivalent to 'strong bread flour' or is it very different? Hello, Bakers' flour is bread flour (due to a high gluten content). You can look for bakers' flour in Nairobi in the manufacturer's depots or ask your nearest wholesaler where to get it or whether they can supply it for you. Examples of companies available are: Broadways, Premier Ltd, United Millers, Maisha Millers. Availability does depend on your location...so just ask nearest wholesalers; they usually can help you out. Hope that helps, thanks for reading the blog. Please explain how whole meal flour can be incorporated into my baked items duch as cup cakes cookies and muffind to make them healthier. Hi thanks for reading. You can always experiment with your original recipes by starting with maybe half of the wheat flour being whole meal flour and half white. You might have to adjust your raising agent slightly (maybe by 5 to 10% more), gradually tweak and test your recipe until you have a healthy cake or cookie recipe that still tastes great when you bake it. Hi, I love the vanilla muffins at tuskys,what flour is that? 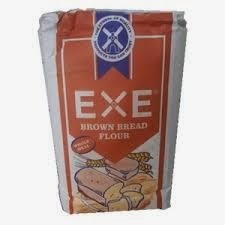 Hi there, I have Exe flour for chapati can I use it to prepare mandazis without adding baking soda? Hi, apologies, I've never tried chapati flour while preparing mandazis only mandazi flour and self rising flour which work well without adding baking soda.